Be the first to share your favorite memory, photo or story of Inez . This memorial page is dedicated for family, friends and future generations to celebrate the life of their loved one. 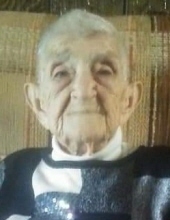 Inez Marie Reedy Baughman of Medora passed away April 14, 2019 at her home in the presence of her loving family. She was born in Jackson County on November 26, 1930 to Ralph Raleigh and Edith Gertrude Scott Reedy. She was a graduate of Brownstown Central High School. On March 1, 1949 she married Ralph Eugene Baughman. Inez was a member of the PTA at Riley School for several years and was president in 1958. She was a past member of Pleasant Grove Methodist Church and Rockford United Methodist Church. Her church home for the last several years was Mt. Zion Methodist Church in Medora. She had been a director of vacation Bible school, a member of the United Methodist Women’s Organization and a Sunday School teacher. She was a correspondent for The Tribune and The Banner for several years. She enjoyed reading, working puzzles, crocheting, embroidering, quilting, was an amazing cook, and loved time with her family. Survivors include her husband, one son, Curtis Raleigh (Jackie) Baughman, a brother, Roy Robert (Marilyn) Reedy, a son-in- law Thomas Goodman, a daughter-in- law Gina Baughman, several grandchildren, great-grandchildren, and great-great grandchildren. She was preceded in death by her parents, a daughter, Edith Elizabeth Baughman Goodman, and a son Anthony “Tony” Eugene Baughman. Visitation will be Tuesday, April 16, 2019 from 4:00 p.m. to 8:00 p.m. at Winklepleck & Brock Funeral Home in Brownstown, IN. The funeral service will be at Winklepleck and Brock Funeral Home on Wednesday, April 17, 2019 at 11:00 a.m. with visitation from 10:00 a.m. until time of service at 11:00 a.m. Pastor Jay Hebard and Pastor Dennis Hadden will officiate. Burial will be in Smallwood Cemetery. Memorials may be given to Smallwood Cemetery, Hospice of Schneck Medical Center, or Mt. Zion Methodist Church. To send flowers or a remembrance gift to the family of Inez Marie Baughman, please visit our Tribute Store. "Email Address" would like to share the life celebration of Inez Marie Baughman. Click on the "link" to go to share a favorite memory or leave a condolence message for the family.